We want you to know how much we appreciated your wonderful class and especially the time and care you took in presenting the material and lessons to us. Your dedication and concern that your students were comfortable and happily learning was most apparent. 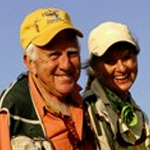 You both have a great gift for combining your skill and knowledge with fun and humor ……thank you for teaching us fly fishing the Whitlock Way! Jack will be better than ever and Donna will have a terrific beginner’s head start! Your fabulous school is still on my mind! I am on a real high and have been since my first day of school. … I can honestly say, there could not possibly be a drug that could give a ‘high’ bigger than mine when I caught my first rainbow trout. My serotonin levels are still way up there! Dave, you must know that those who regularly read fly-fishing publications are preconditioned to an appropriate respect for your abilities and dedication to fly-fishing. Count me among that group. I also play golf, and suspect that I would have a similar feeling if Tiger Woods was working with my golf game, although he would clearly lack the life experiences you are able to share. It was awesome. There I was casting loops with a yarn line on Dave Whitlock’s floor! Soon those feelings were replaced, however. As we learned from the two of you, we also were making friends. Welcoming strangers into your home every week would be difficult, but I suspect you seldom say good-by to a stranger at class’s end. You’re enthusiasm for people and devotion to fly-fishing are a rare combination. The two of you compliment each other beautifully. Thank you for sharing three of your days with me. My wife will never give me a better birthday gift than this. Mere words can’t express my heartfelt thanks to both of you for giving me an experience of a lifetime. I felt like the proverbial child the night before Christmas each night anticipating the next day and what I’d learn. One can sure tell you are true experts at teaching. For the first time in years of flyfishing I could understand and visualize what makes a good cast. Now all I have to do is train my muscle memory so I can do it! … Thanks again for teaching me something I’ll be able to use and apply the rest of my life. I just had to drop ya’ll a note and tell you how pleased I was with the recent school I attended. I don’t remember when I have had as much fun and been educated at the same time. Until the class I was intentionally avoiding flytying and fishing below the surface. I was saving them for later in life since I view flyfishing as a life-long pursuit toward goals that can never be fully realized, much like golf. Forget golf, now! What I need is a vice and a sinking-tip line! You guys have accelerated my pace and forced me ahead. Don’t ever change a thing about the school. Ya’ll have it down pat.